Is Consolidated Edison, Inc. (NYSE:ED) worth your attention right now? Even though prominent investors are taking a bullish view on the margin, the overall hedge fund sentiment towards ED is still negative. The number of long hedge fund positions advanced by 12 in recent months. 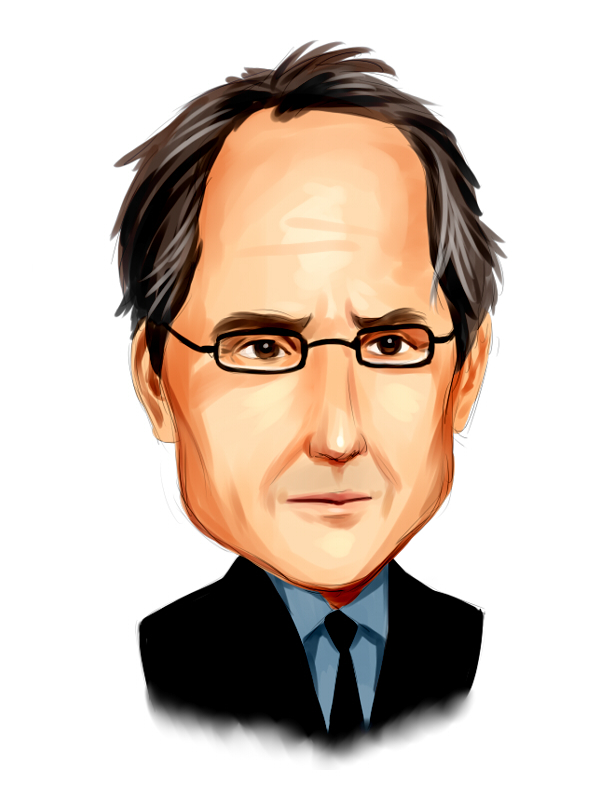 Our calculations also showed that ED isn’t among the 30 most popular stocks among hedge funds. ED was in 23 hedge funds’ portfolios at the end of the fourth quarter of 2018. 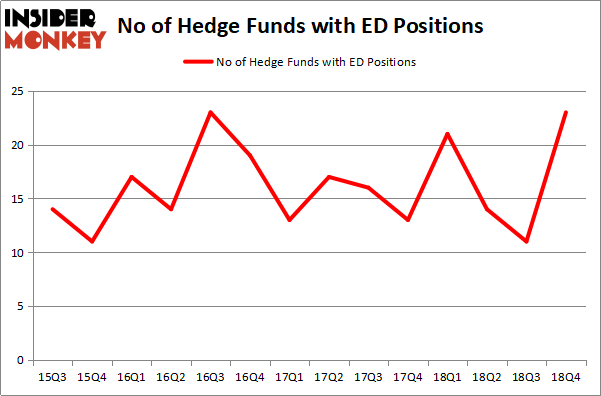 There were 11 hedge funds in our database with ED positions at the end of the previous quarter. Let’s go over the key hedge fund action surrounding Consolidated Edison, Inc. (NYSE:ED). At Q4’s end, a total of 23 of the hedge funds tracked by Insider Monkey were bullish on this stock, a change of 109% from the previous quarter. Below, you can check out the change in hedge fund sentiment towards ED over the last 14 quarters. With hedge funds’ capital changing hands, there exists a select group of key hedge fund managers who were increasing their holdings considerably (or already accumulated large positions). More specifically, AQR Capital Management was the largest shareholder of Consolidated Edison, Inc. (NYSE:ED), with a stake worth $558.2 million reported as of the end of September. Trailing AQR Capital Management was Renaissance Technologies, which amassed a stake valued at $270.8 million. Millennium Management, D E Shaw, and Zimmer Partners were also very fond of the stock, giving the stock large weights in their portfolios. With a general bullishness amongst the heavyweights, key hedge funds were leading the bulls’ herd. D E Shaw, managed by D. E. Shaw, established the most valuable position in Consolidated Edison, Inc. (NYSE:ED). D E Shaw had $73.1 million invested in the company at the end of the quarter. Stuart J. Zimmer’s Zimmer Partners also initiated a $55.4 million position during the quarter. The following funds were also among the new ED investors: Phill Gross and Robert Atchinson’s Adage Capital Management, Brian Olson, Baehyun Sung, and Jamie Waters’s Blackstart Capital, and Michael Gelband’s ExodusPoint Capital. Let’s now review hedge fund activity in other stocks – not necessarily in the same industry as Consolidated Edison, Inc. (NYSE:ED) but similarly valued. We will take a look at Southern Copper Corporation (NYSE:SCCO), Centene Corp (NYSE:CNC), Sprint Corporation (NYSE:S), and Baker Hughes, a GE company (NYSE:BHGE). This group of stocks’ market caps match ED’s market cap. As you can see these stocks had an average of 30.75 hedge funds with bullish positions and the average amount invested in these stocks was $766 million. That figure was $1252 million in ED’s case. Centene Corp (NYSE:CNC) is the most popular stock in this table. On the other hand Southern Copper Corporation (NYSE:SCCO) is the least popular one with only 15 bullish hedge fund positions. Consolidated Edison, Inc. (NYSE:ED) is not the least popular stock in this group but hedge fund interest is still below average. This is a slightly negative signal and we’d rather spend our time researching stocks that hedge funds are piling on. Our calculations showed that top 15 most popular stocks among hedge funds returned 19.7% through March 15th and outperformed the S&P 500 ETF (SPY) by 6.6 percentage points. Unfortunately ED wasn’t in this group. Hedge funds that bet on ED were disappointed as the stock returned 12% and underperformed the market. If you are interested in investing in large cap stocks, you should check out the top 15 hedge fund stocks as 13 of these outperformed the market.